Geal-charn and A'Mharconaich are two of Scotland's most accessible Munros, their rolling bulk rising from high up on the Pass of Drumochter. The A9 trunk road delivers you right to their foot and, as the road rises to over 1,300 feet where the walk begins, you get a fine head start. The climb on to Geal-charn's stony summit is strenuous in places but, as you approach the top, prepare to be amazed by the spectacular views across Loch Ericht towards the wide plateau of Ben Alder beyond. These remain with you as you pass over the col above Coire Fhar and start the ascent of neighbouring A'Mharconaich, the day's second Munro and the slightly higher of the two peaks. Choose a good clear day and you should enjoy an excellent if undemanding mountain walk with some of the finest panoramas in this part of the country. From the car park at the start, head west along the track towards Balsporran Cottages, passing over the River Truim. The way runs along the front of the lonely white houses before negotiating the Perth to Inverness railway line at a level crossing with kissing gates on either side. Continue straight on along a Land Rover track, across an area of open ground, following the Allt Coire Fhar into the glen beyond. Cross two bridges constructed from railway sleepers as the route rises through heather. Just beyond the second bridge, a narrow path branches off to the right. It ascends alongside the Allt Beul an Sporain and can be rather wet and muddy in places. The climb is gradual at first, but rises more steeply up the wide north-east ridge of the hill. Be prepared for some boggy spots as the path cuts a course up through the heather to emerge on to drier, stony high ground. 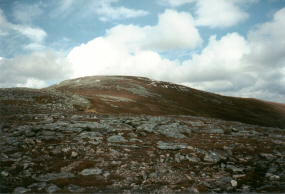 The top of Geal-charn is soon reached. 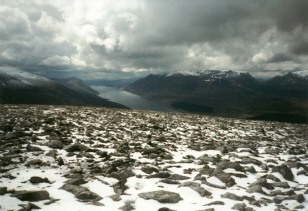 At 3008ft (917m) above sea level it only just qualifies as a Munro. The second summit of the day, A'Mharconaich can be seen across the glen to the south. The path descends over rocky ground to the head of Coire Fhar. If you need an escape route at this point, a track descends north-east into Coire Fhar, down to the left, leading directly back to the start. However, to continue the walk, head across the pass and join a path rising over the open hillside, climbing on to Bruach nan Iomairean, an outlying top on the long summit plateau of A'Mharconaich. The ascent reaches a rundown fence line. Turn left here and follow the ridge to the top, marked by a cairn. To descend, walk north off the summit, a path dropping down to the left of a steep craggy coire directly below the summit. In misty conditions, take extreme care not to go too close to the edge. The path skirts round, dropping quite steeply at first, to run out over a broad heather shoulder. The way is indistinct in places but follow the ridge north-east and you will pick up a more obvious route lower down. Continue down towards Balsporran Cottages. The path emerges next to the Allt Coire Fhar, just above the cottages. The easiest way to span the wide and fairly fast flowing burn here is to continue down and use the metal walkway on the edge of the railway bridge, ensuring there are no trains coming in either direction when you do so. From there, cross the line at the level crossing and retrace your steps past the cottages to the start. Start/parking Off-road layby at Balsporran Cottages on the A9 in the Pass of Drumochter, four miles south of Dalwhinnie. GR: 628793. Grading Tracks and paths over open hillside. Suitable for fit, reasonably experienced hillwalkers. Be warned that when the weather up here is bad it can be extremely miserable.